A Caucasian adult woman lying in a hospital bed, covered with a sheet. She is having blood drawn by a Caucasian male doctor with a Caucasian female nurse is in attendance. 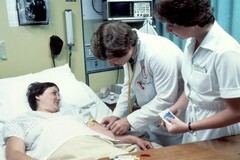 The patient is looking at the doctor and smiling.